Yoo hoo! 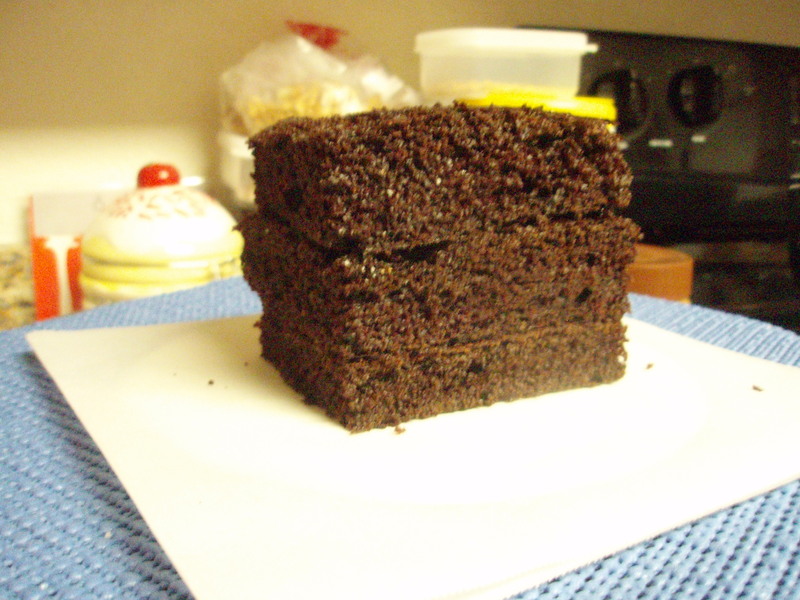 I’m pretty excited to share this lil’ creation with you guys… It’s my first mini cake ever! And I really liked how it turned out. 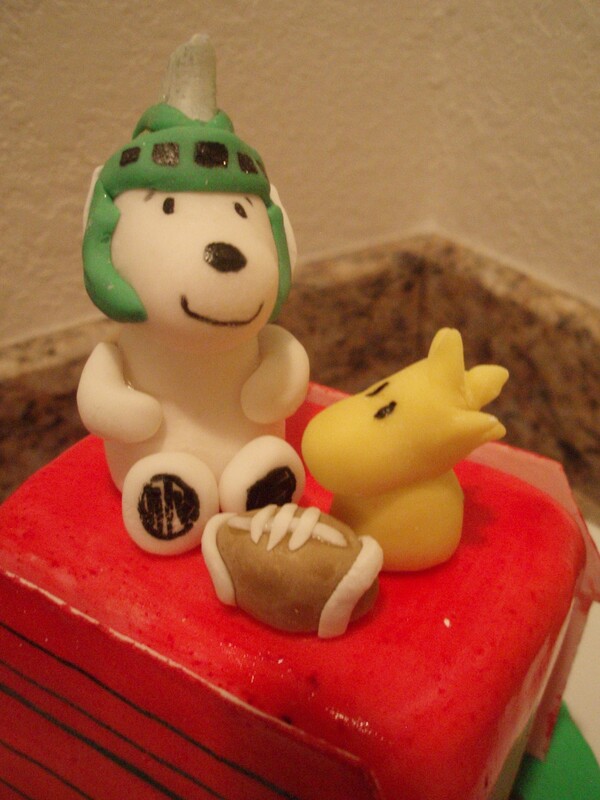 This mini cake was made for my favorite Michigan State alum, Matt, who is faithful to Spartan football and has an equal love for Snoopy. These two favorites, plus the fact that it’s football season, lent to some inspiration for this project. When I think about Peanuts, I immediately imagine his little red doghouse and all of the characters Snoopy takes on when he’s hanging out with Woodstock. You know, he’ll have his typewriter, he has his famous pilot outfit, and of course Joe Cool. 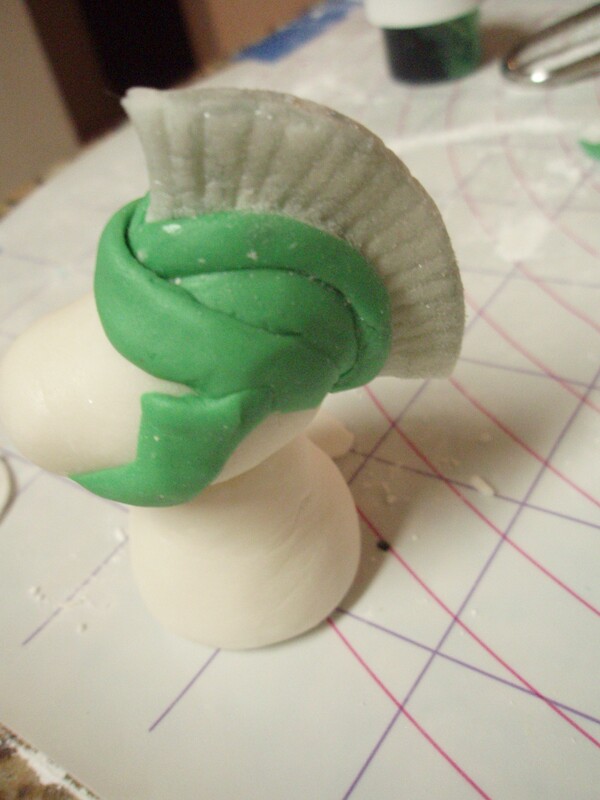 Since Snoopy’s such a charismatic actor with a chameleon-like aptitude for assuming different roles, I decided to pop on a Spartan helmet and let him enjoy being part of the Big 10 conference for the day. 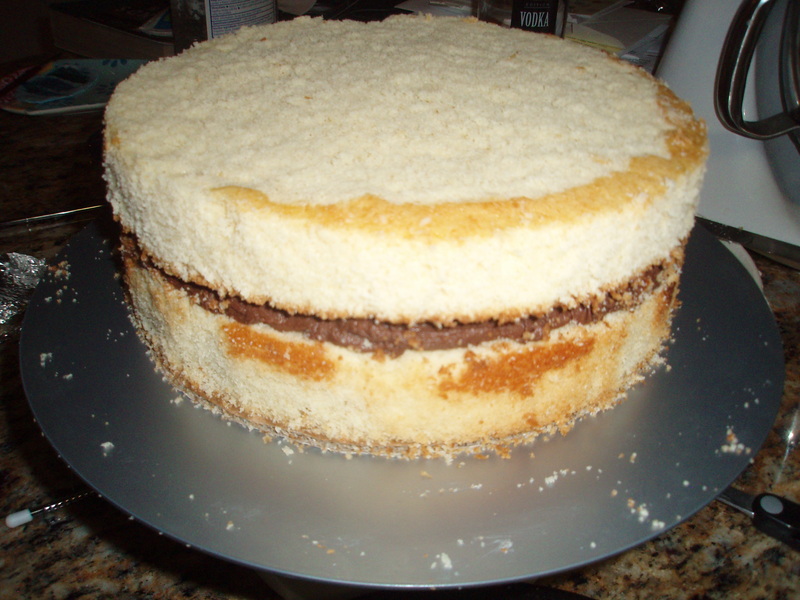 Here’s what will be the dog house- 3 layers of chocolate fudge cake, filled with chocolate ganache, and then covered in buttercream. 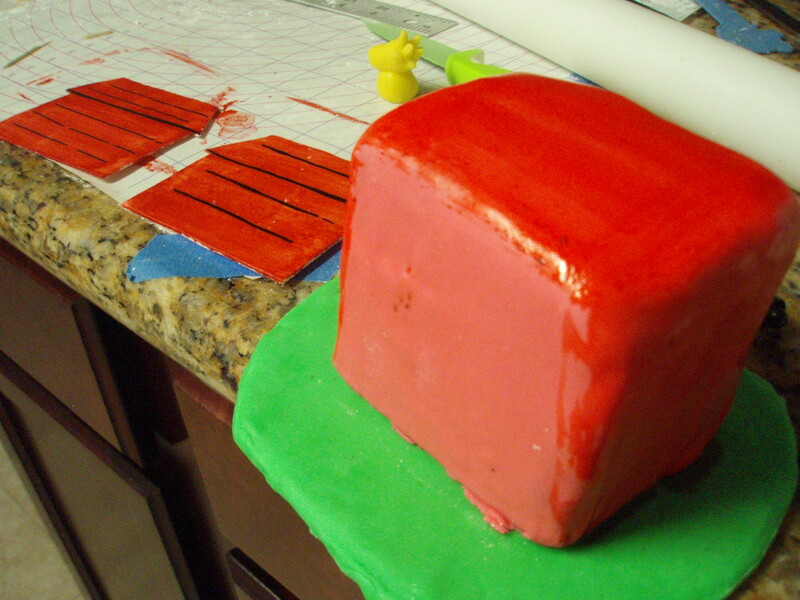 I put fondant over this, then painted it red using vodka and food coloring as my medium. (Picture further down). 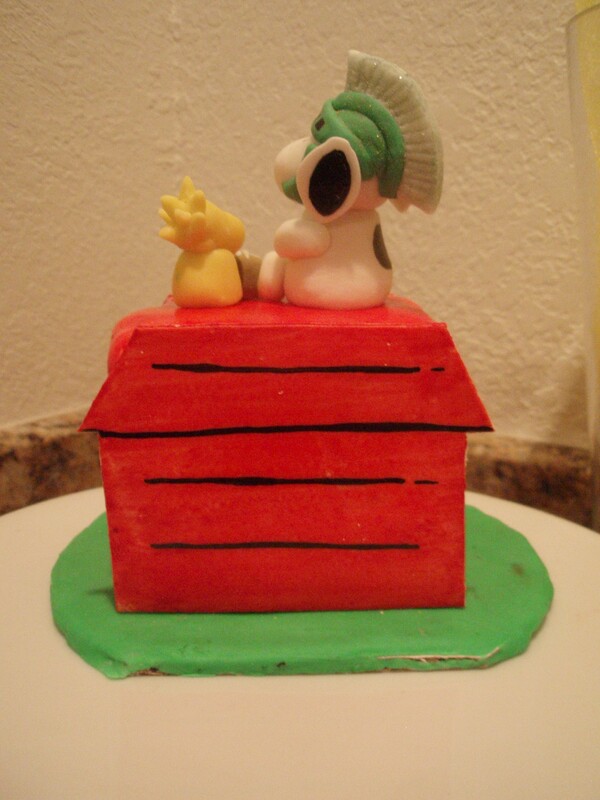 I wanted to go for a 2-D, more cartoony and comic strip look for part of this, so instead of molding the dog house, I just cut out two flat pieces of gum paste and painted them red (same technique as above). One of my newest investments was a package of 10 edible ink markers! This made my life so much easier when it came down to details like the lines on the side of the dog house. Paintiing these would have been a nightmare. 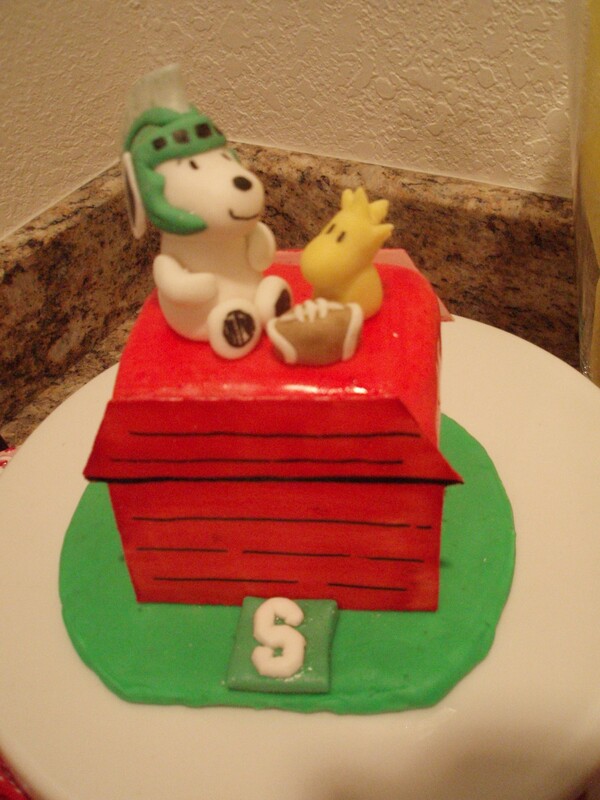 Here’s the painted, fondanted dog house base, atop a cardboard circle covered in green fondant, serving as the grass. Now for the main characters 🙂 Here are the starting forms of Snoopy and Woodstock. 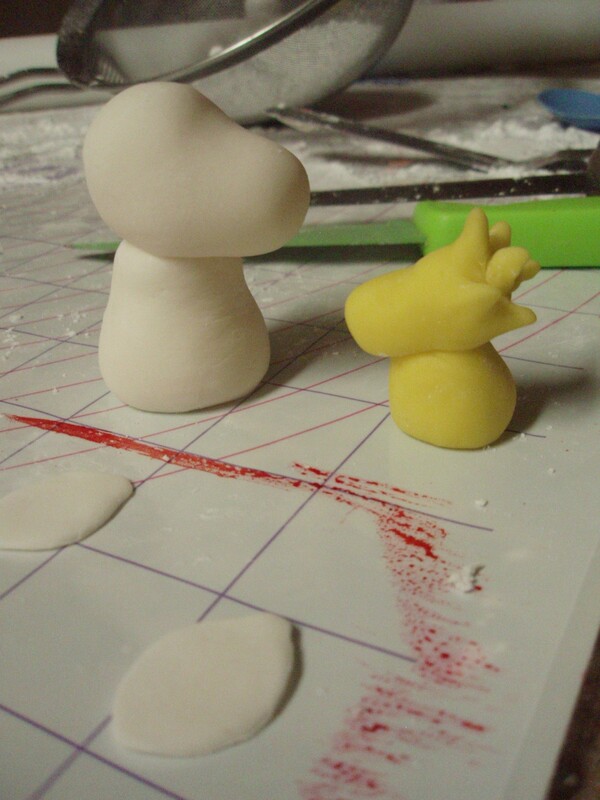 Snoopy is made of gumpaste, and Woodstock is made of yellow fondant. Below I added the face shields and the helmet mask. 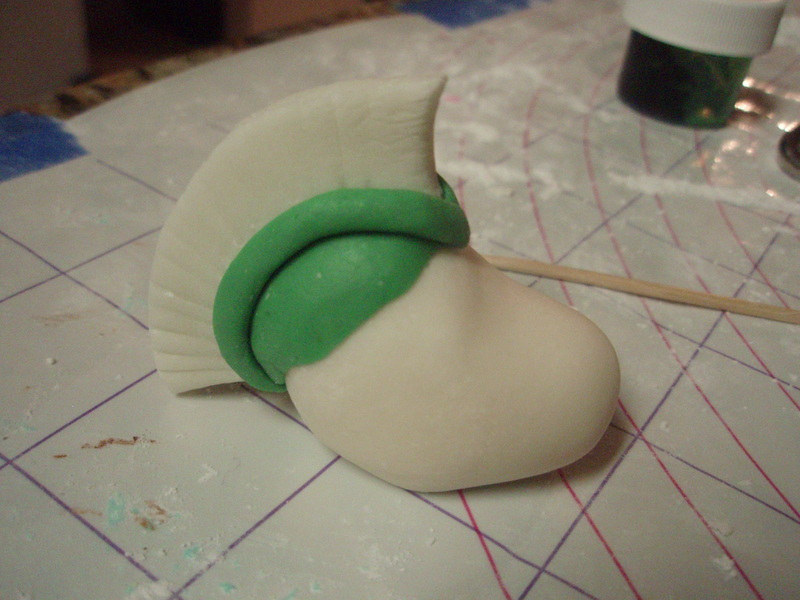 I had added ridges to the white part of the helmet using a paring knife, but they didn’t really show up on just the plain white gum paste. 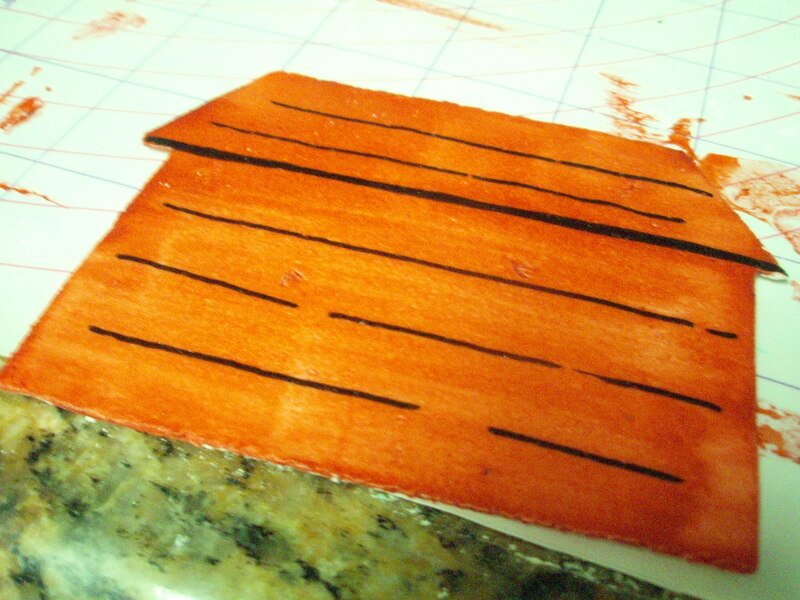 So I painted over it with a little silver edible glitter to highlight the dimensions of the ridges. Finishing touches? 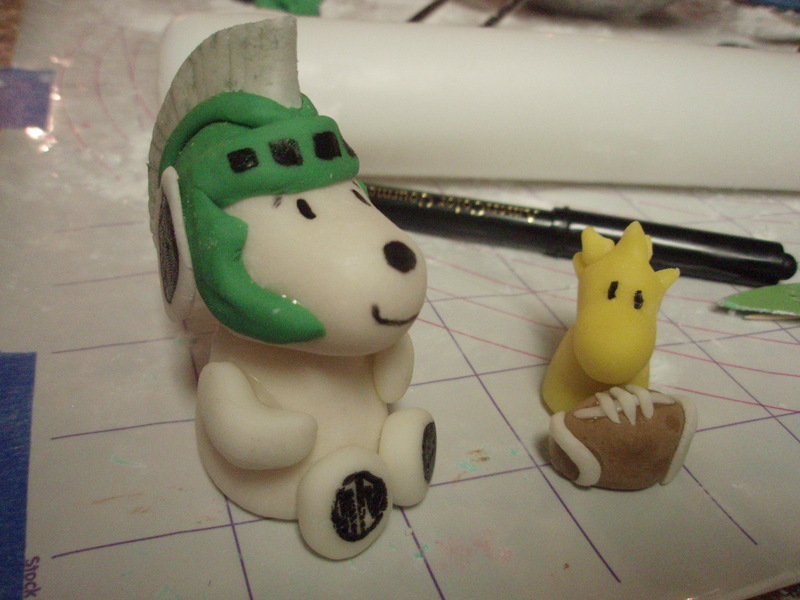 Woodstock got some eyes and a fondant football. Snoopy got a face, ears, and limbs. We can’t forget the little black pads on the bottom of his feet! Here they are, placed atop the house, and a little green S emblem at the bottom. Looking off into the distance? 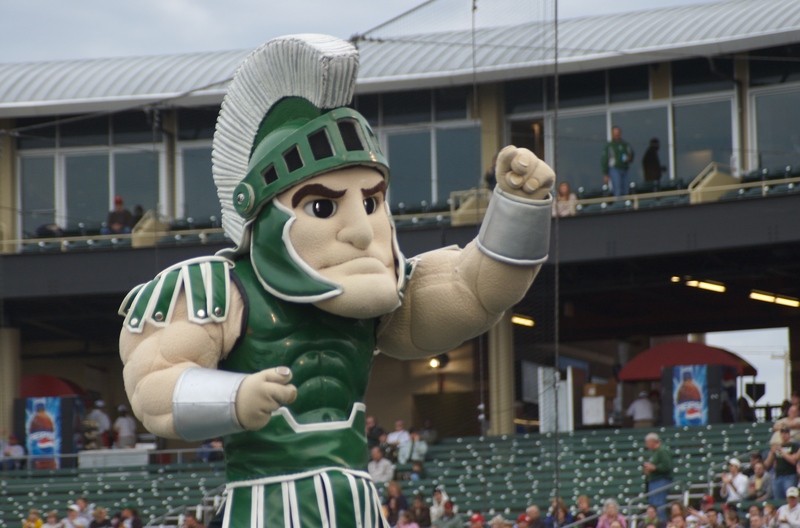 Or watching the Spartans win! Oh my, another post for May, I’m becoming too ambitious. My friend Bri has been getting me “cake-gigs” with her friends who are celebrating! This weekend was a graduation for her friend Dave. He and two other friends just graduated from NAU with a degree in Education. Amber, Dave’s wife, organized the cake and party. 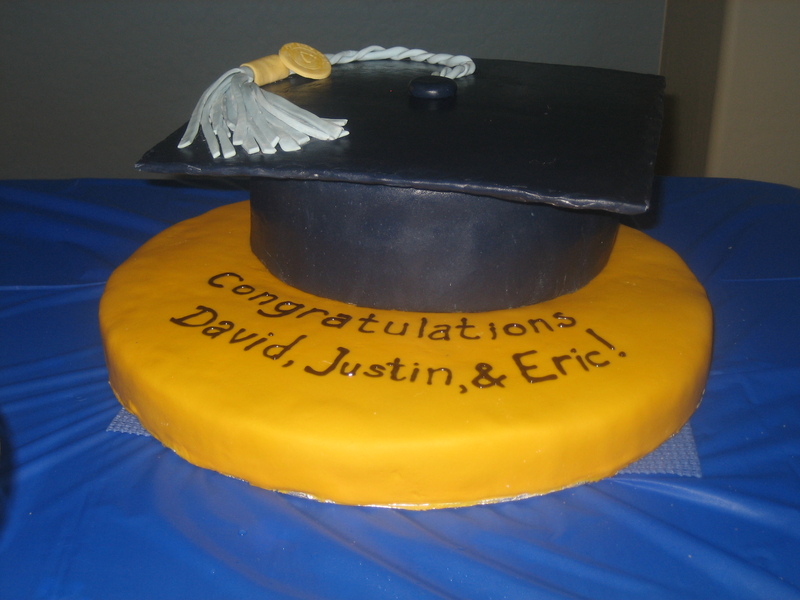 It was to be for 40 people (at least), preferably in the shape of a graduation cap, with the NAU colors (dark blue and yellow), and with a light blue tassle for Education. 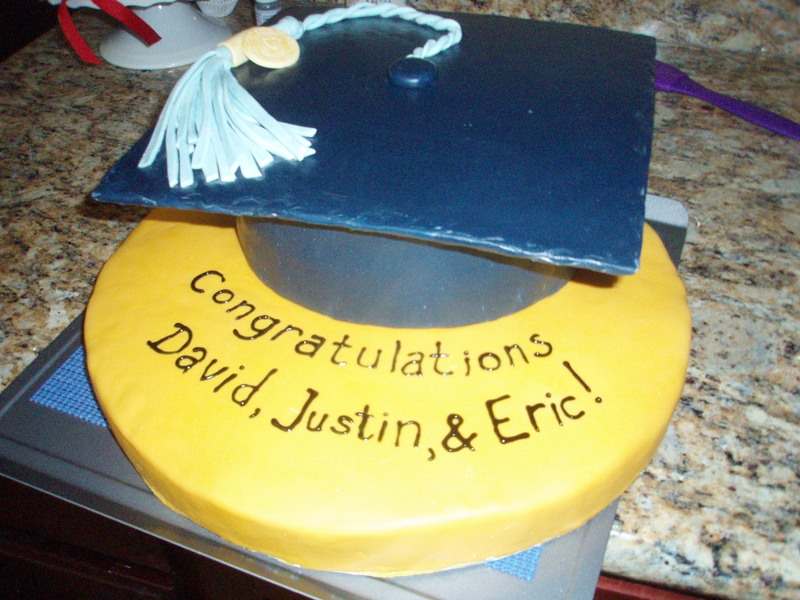 At first I wanted to do a giant hat, and that’s it… a giant mortar board graduation cap. However, with a 14″ round pan as the base, it would have looked a little more than slightly ridiculous. Instead, we came up with a design where there’s a nice 9″ round hat sitting on a single 14″ round base. Proportions, I’m learning, are not as easy as they seem. 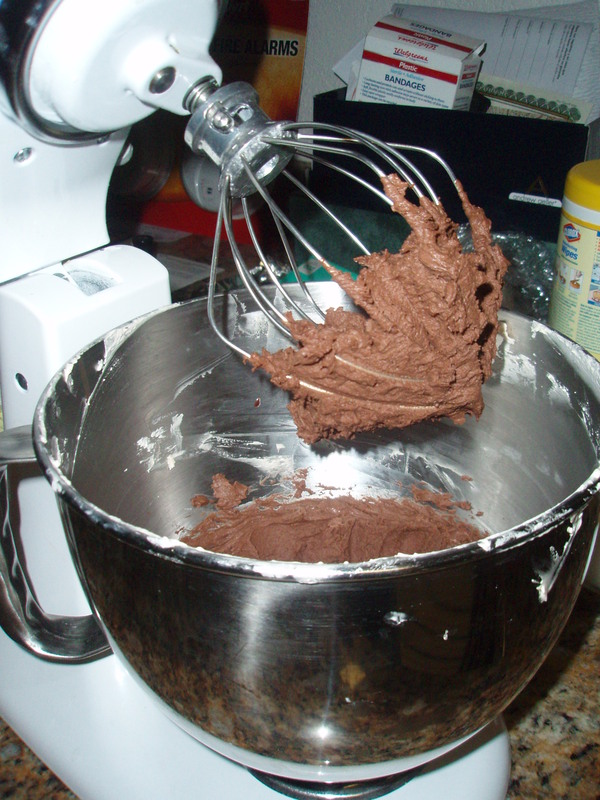 Directions: Microwave whipping cream in a ceramic or glass bowl for 1 min. 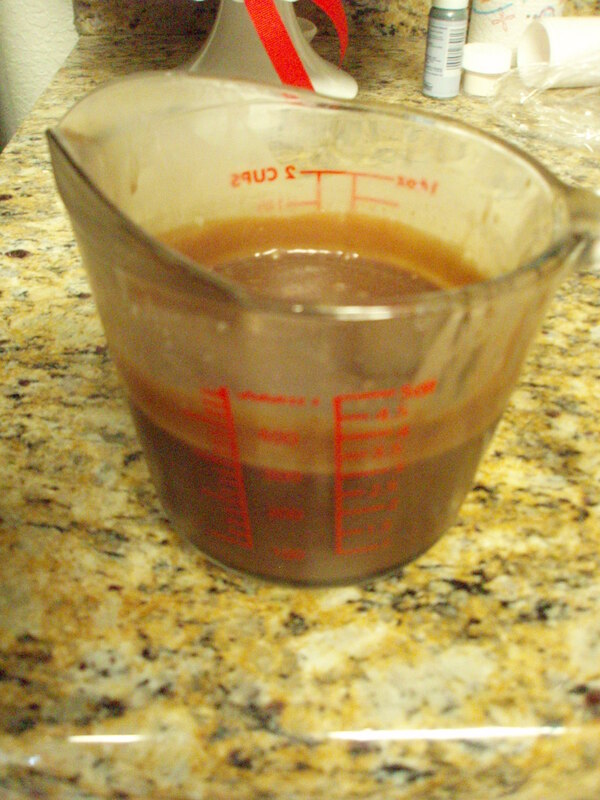 Remove from the microwave and pour chocolate chips/chunks/pieces into the hot cream. Let sit for 1-2 min. Whisk to an even, smooth and creamy consistency. 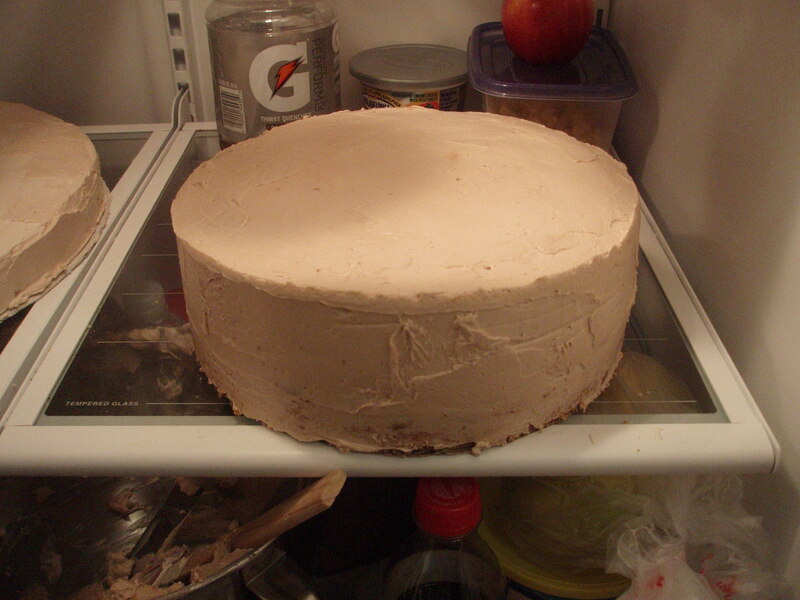 Let cool to room temperature, then refrigerate overnight, covered tightly with saran wrap. 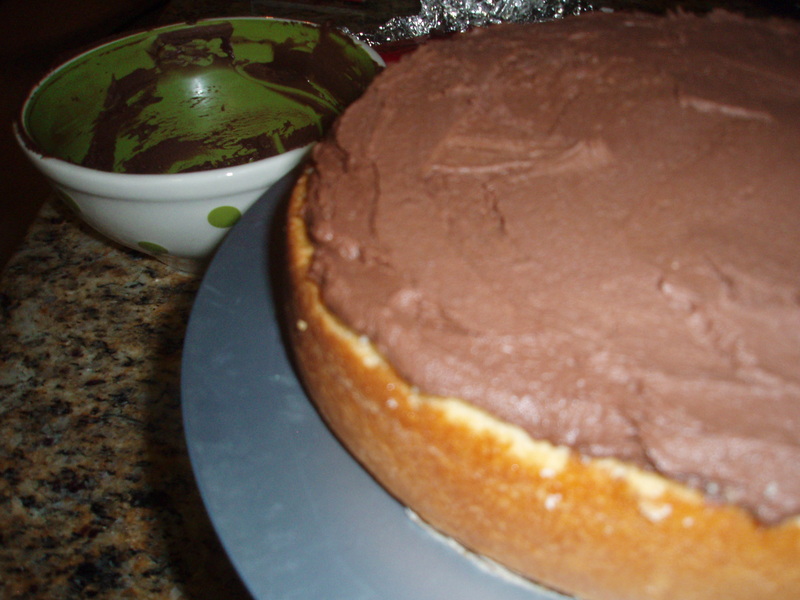 The next day, whip the ganache until it resembles a nice, thick, chocolate frosting. I wasn’t sure how ganache would work with fondant, as it’s a bit stickier and less solid than buttercream, so I stuck with my old stand-by this time… and butter-creamed the layers to prep for fondant. 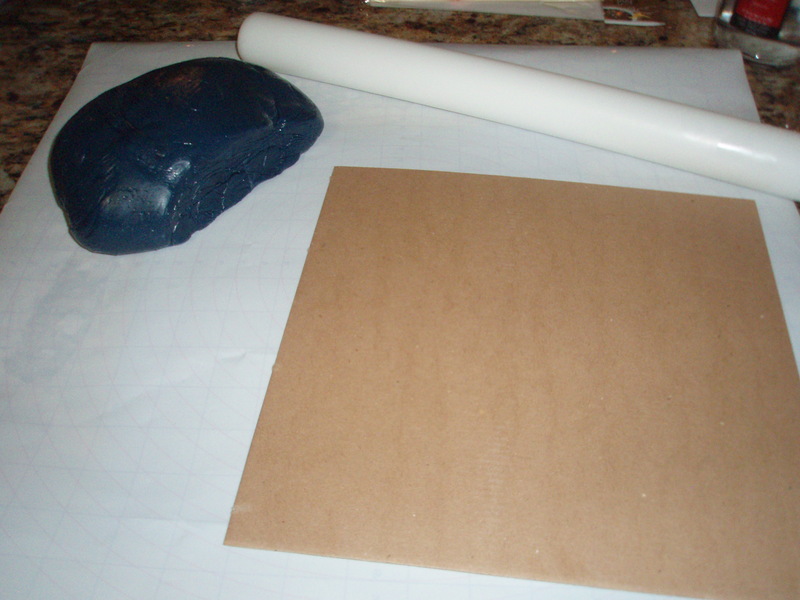 Finally, fondant time! 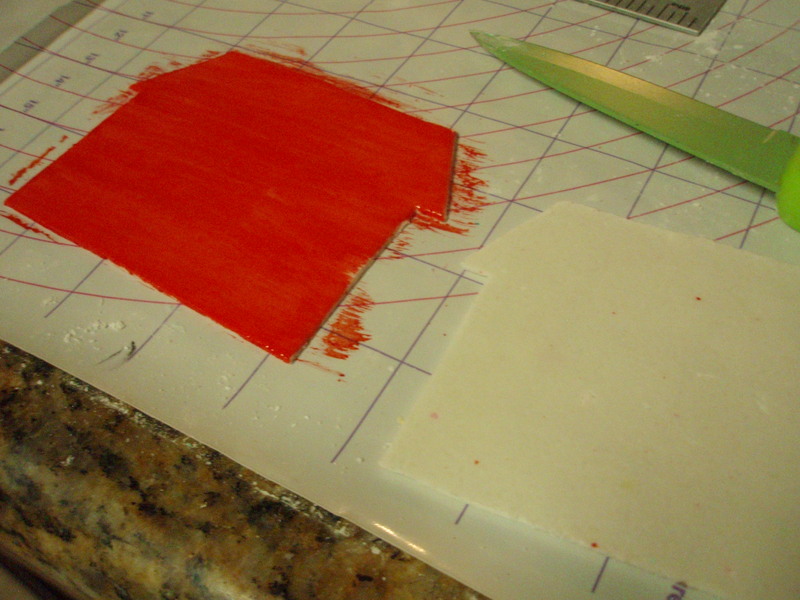 This was – and is- always the most difficult part- making and coloring fondant in a good sized quantity to ensure an even covering of the cake. 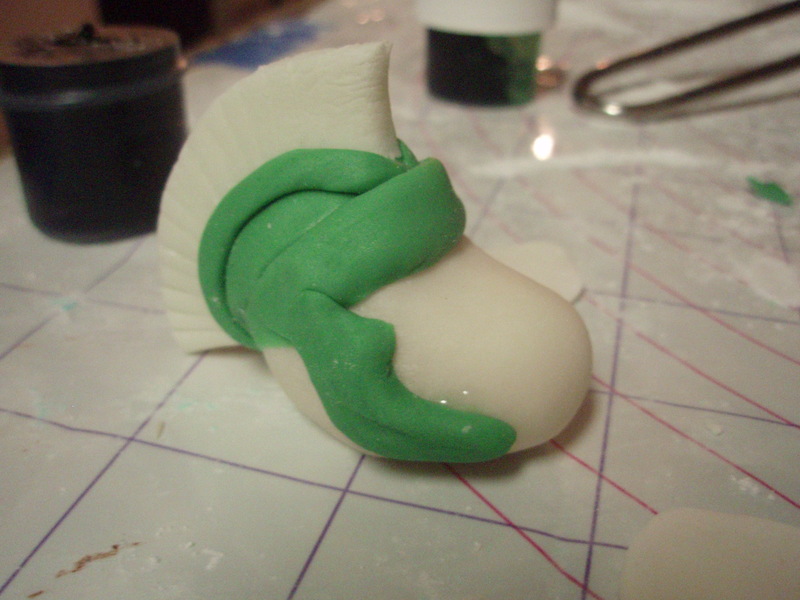 Sigh, Bri put her muscles into this one, she was my designated kneader of the fondant. Navy is probably one of the most difficult colors to achieve because of its darkness. 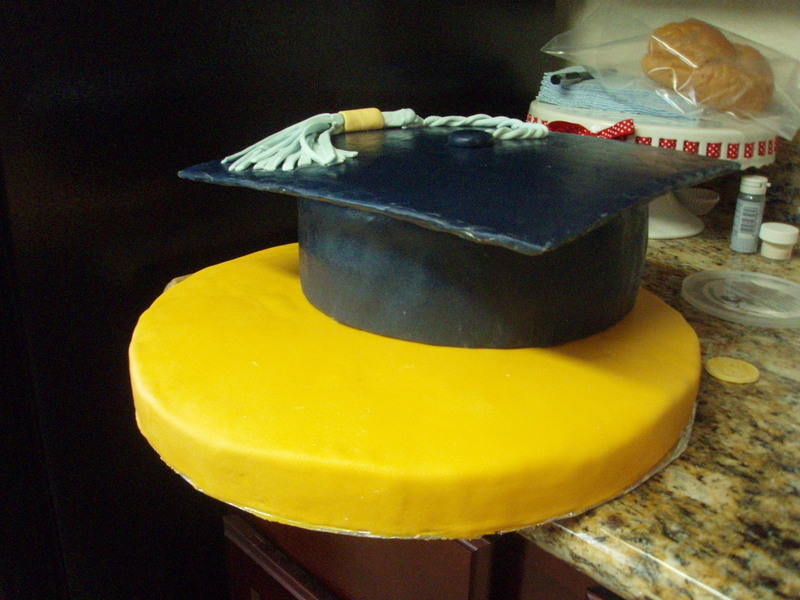 For the flat mortar board top, I covered a 10.5″ square with blue fondant. 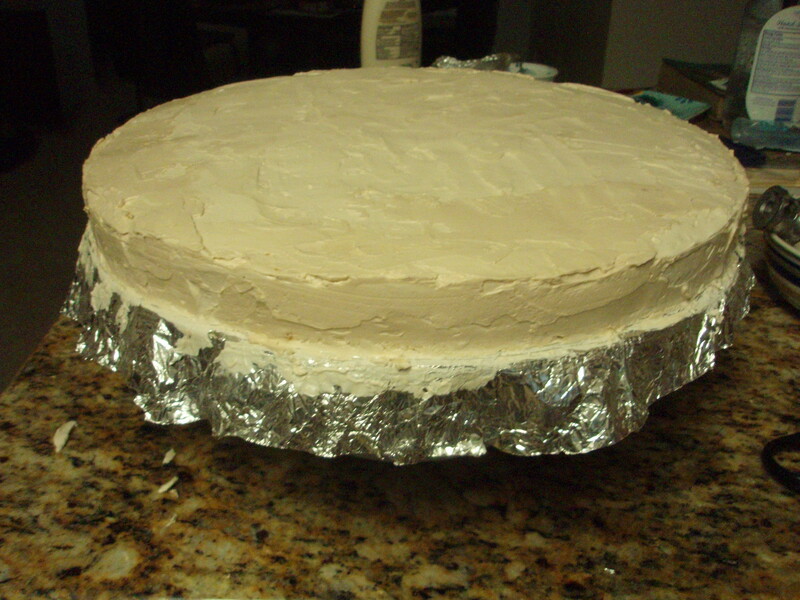 I covered the base in “golden yellow.” Looks a bit like cheese in the photo, no? 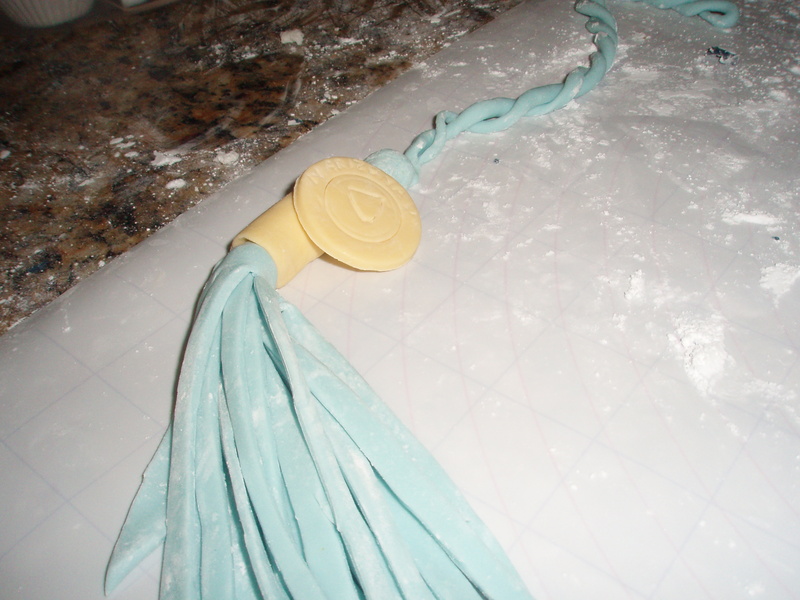 I mixed a little blue with a ton of white gum paste to make the tassel. I basically just rolled out a rectangle, made some vertical cuts into it to create the tassel look, and then rolled the top together, securing it with a little watered down golden yellow. 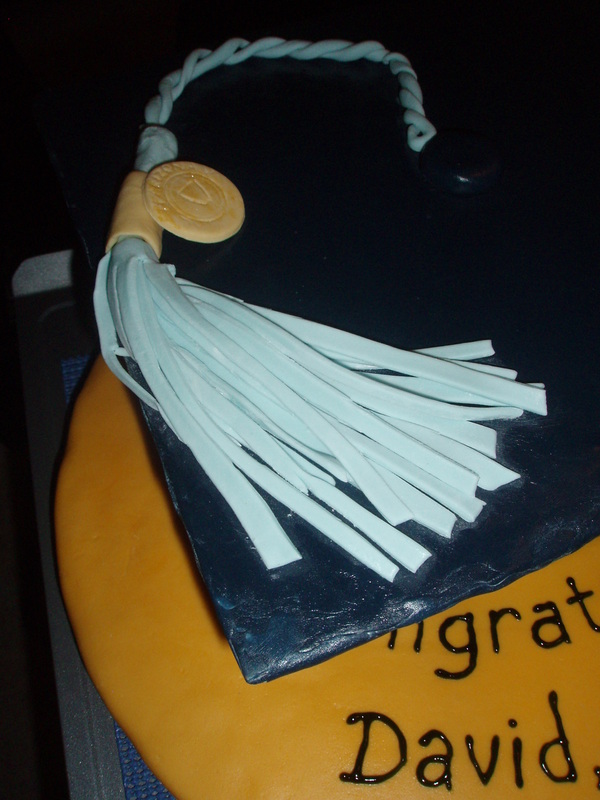 A close-up of the tassel on the hat. 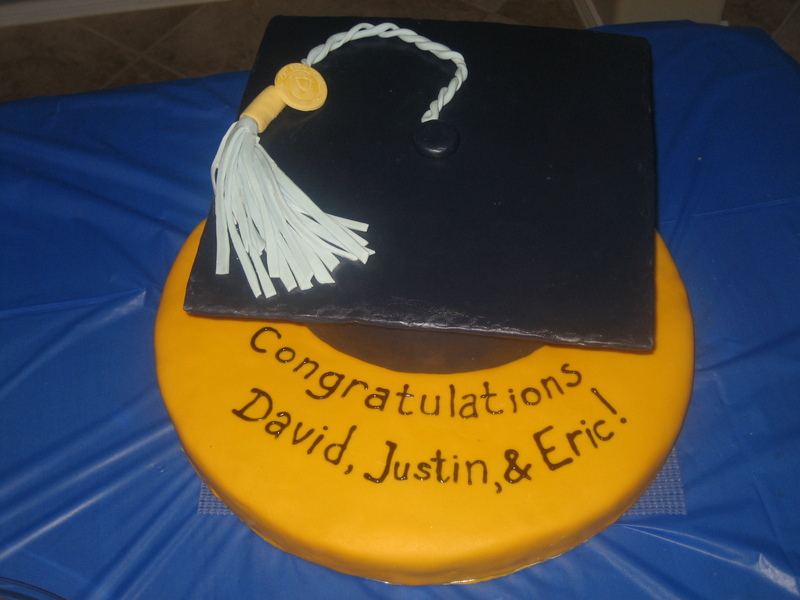 Lastly, two photos taken at the graduation party. Ever so slightly different.